Posted on May 24, 2016 by No Map Required Posted in Massachusetts, Places, United States	. I was bracing myself for some sort of extra scrutiny coming into the US after being gone for so long in so many countries, but, amazingly enough, no. The customs guy had already stamped our passports when he asked with a stern expression, “Where are you coming from?” and I just opened up and GUSHED as this giant, one-breath, run-on sentence raced out of my mouth, “Well! 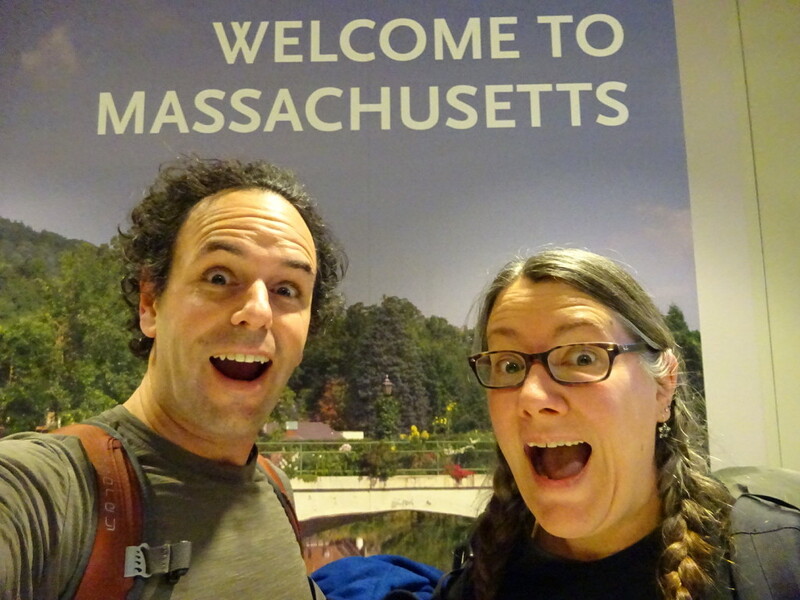 We are just home from a massive trip around the world a life long goal that took us to five continents and 18 countries we started in Costa Rica…” He gave us a huge smile and asked a few questions about how we did it and then said, in an awesome Boston accent, “Welcome Home!” And just like that we were In! Where am I? Tap, tap my heels again, where am I? It was late at night when we arrived at our luxury apartment for our first night in the US in 15 months. Why someplace so fancy? Well, the deal is that prices in Boston are sky-high for even just an AirB&B room in someone’s house. 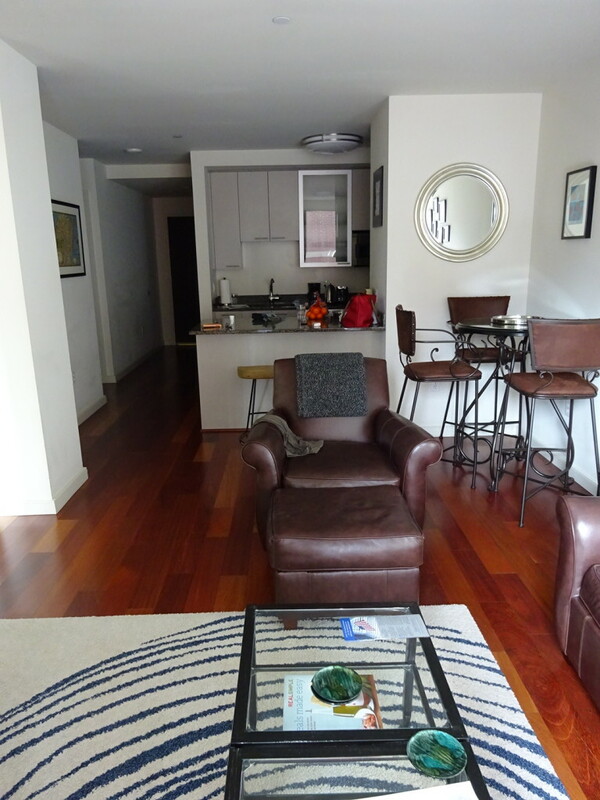 We sacrificed location (aka, being anywhere near Harvard Square) in exchange for luxury and got this super-high-end one-bedroom apartment to ourselves for the same price as a lone room in a posh neighborhood. On the one hand we were right next to a bunch of sports bars and the TD Garden where the Bruins play – luckily we love sports. On the other we were greeted by revelers all hours of the night and a certain amount of vomit in the streets in the morning. “Welcome to America, watch where you step!” This would take some getting used to. The apartment, though! Getting to wash our clothes for the first time in a month from the comfort of our own place was quite a treat. Ditto for the real shower — without any wires showing or water flooding the bathroom or any weird smells. Luxury was totally worth it! Day One we needed some food. We had the choice of extremes nearby: 7-11 or Whole Foods. Not fair, Boston! Not fair. Wanting some fruit, we chose Whole Foods. I’m not kidding when I say the produce section took my breath away. I just stood there turning in a circle, head swirling, feeling kinda woozy. We hadn’t seen anything like this quality and selection and high polished-ness in 15 months. WOW is all I can say. We managed to load up and get out with only a small bit of anxiety, but this freaked us out. Thank goodness for the co-ops in Zurich that got us at least marginally prepared! Look at THAT! It’s all so CLEAN! And SHINY! Perhaps before I go further I should explain why we started our return home in Boston of all places. We knew we wanted to get back to Seattle the slow way, giving us time to start absorbing the shock of it all. Not hitting Seattle first thing meant we wouldn’t have to start the work of re-setting our lives immediately. This turned out to be a good plan because we were pretty jet-lagged, exhausted and bewildered upon entering American life again. Yeah. Bewildered. That’s a good word to describe it. A few days in Boston let us get used to the idea a bit. It also gave us a chance to go to the movies!! The only thing Aaron really missed while we were gone was the Movie Experience! The darkened theater. The popcorn smell. The Dolby sound. Funny, I would have thought it would be chocolate cake or something, but no, it was the movies. Day Two found us out for a totally jet-lagged walk when, in our daze, we saw a movie theater. 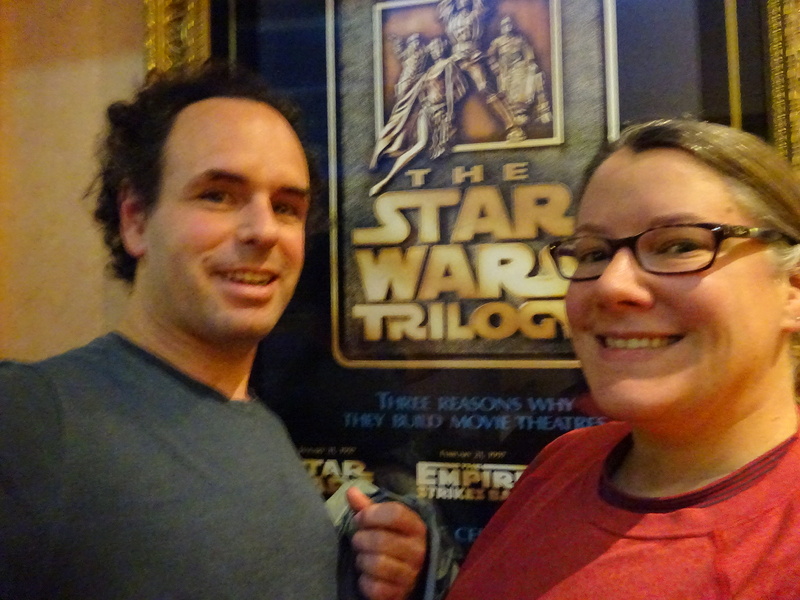 It must have been meant to be, because the new Star Wars was starting in just five minutes. We grabbed some tickets and ran inside. Unbelievably awesome – we loved it! We didn’t even fall asleep once! Buuut, that was about all we could handle. 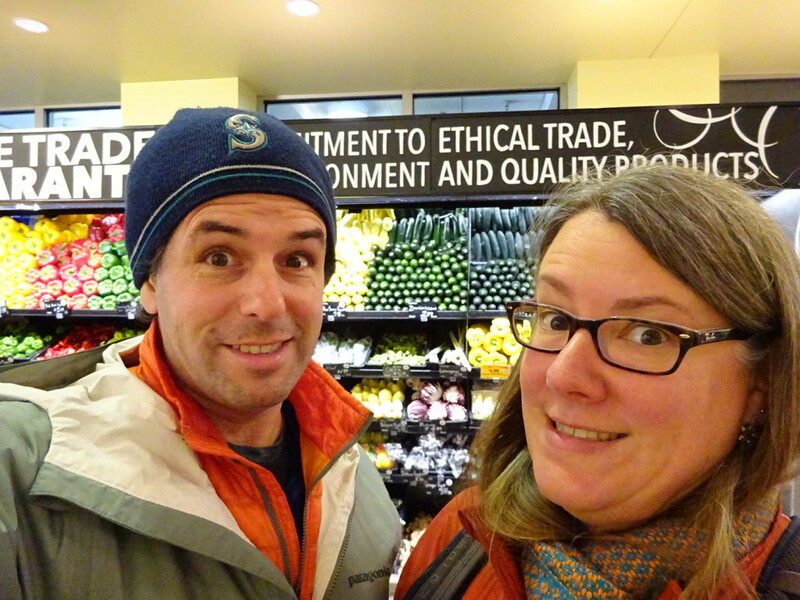 We headed home to eat some of our overpriced Whole Foods goodies and go to bed. It was the middle of the day. The band is back together! All I can say is: Dang, we’re a happy looking lot! 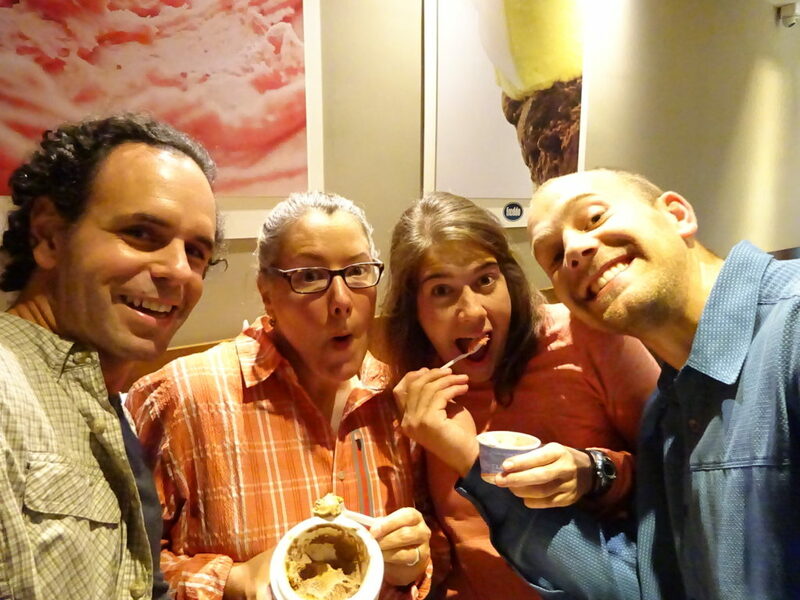 Remember TJ and Taylor from Juan Pablo’s in Chile or ice cream in Buenos Aires? They were our travel friends in South America and they call Boston “home” at the moment with TJ in business school (Congrats on finishing your first year!!!) while Taylor rocks the personal trainer world. Plus, I love Boston. I lived here years ago and visiting the city with Karen N. was my last trip before the real Big Trip. It’s one of my all-time favs. I admit it, I love that dirty water mmmmmmmm Boston you’re my home (away from home). We love keepin’ it classy with the T’s. I believe this is where we purchased ice cream by the kilo in Buenos Aires. TJ and Taylor had us over for dinner where we reminisced about all our respective travels and they gave us a few pointers on reentry. One of the biggest and best highlights of the week. 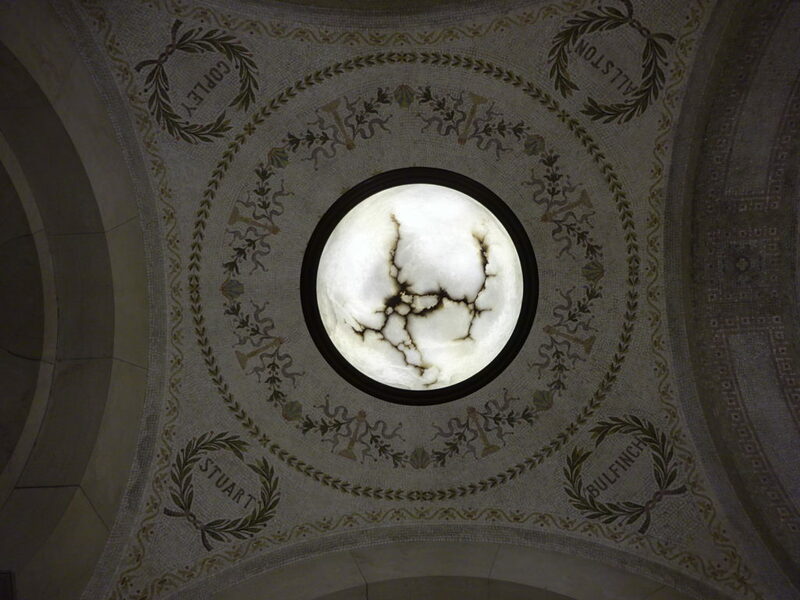 Even though I’ve been to Boston several times, I’d never stepped foot in the famed Boston Public Library. Turns out they offer a free tour which was kind of perfect … simply show up and follow along. Let me just say: Awesome! Our tour guide was incredibly knowledgeable and the architecture is fantastic. I’m SO glad we went. Boston Public Library – revolutionary because it was the very first library in the country to loan books for free. At least that’s the claim. 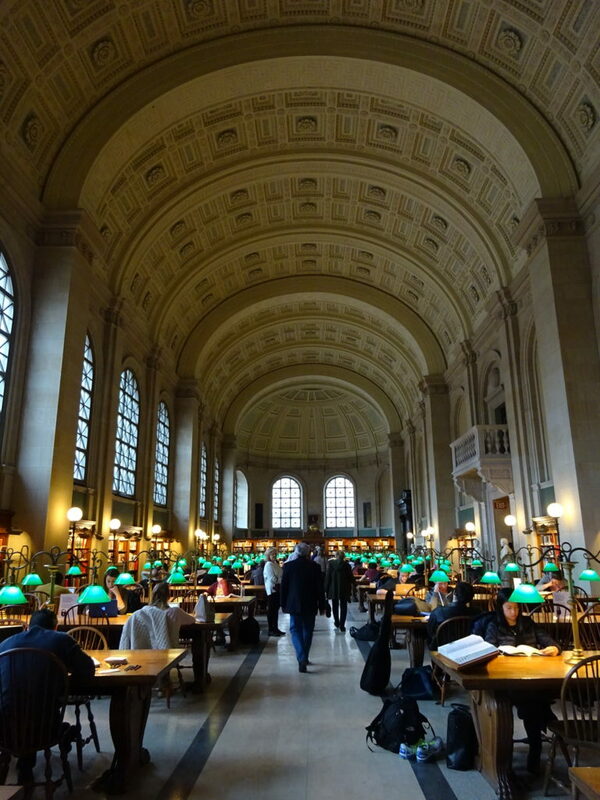 Bates Hall, exactly how you imagine the inside of Boston Public Library. Man! That architecture…they sure knew how to do it back in the day. 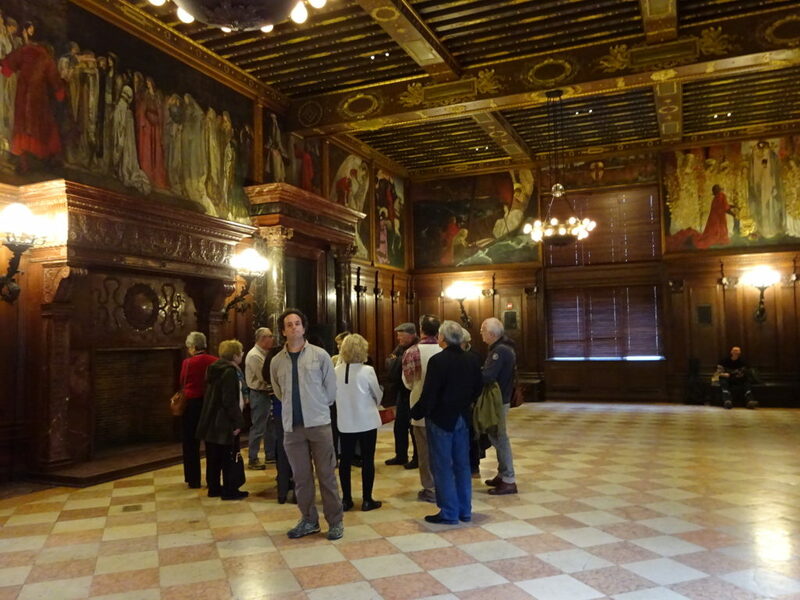 On tour, we learned oodles about the impressive art and architecture. This was the story of Sir Lancelot (gotta catch up on that some day). It was spread across a series of panels around the room and students used to be brought in to sit and learn the story during school. Quite the field trip! 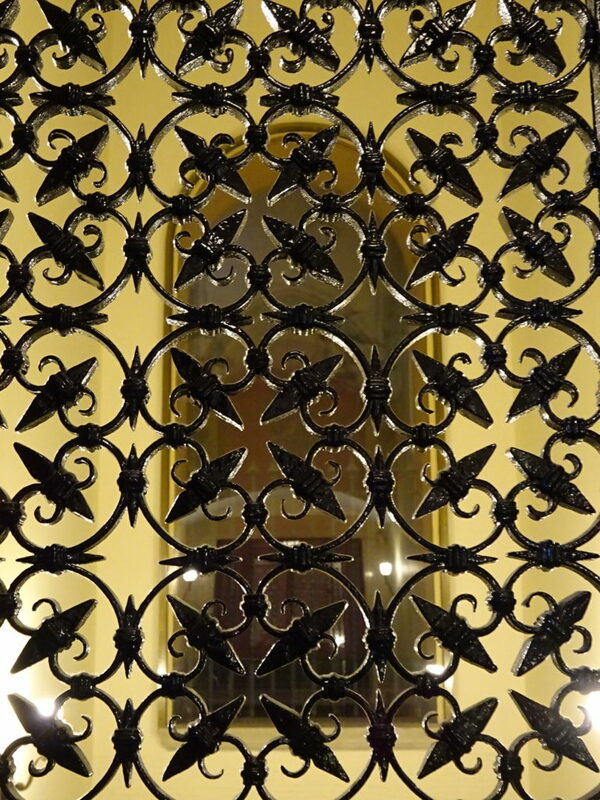 Love the mosaic ceilings…not quite Gaudi or Barcelona, but it has a refinement of style we rarely see today. …and all these details everywhere you looked. 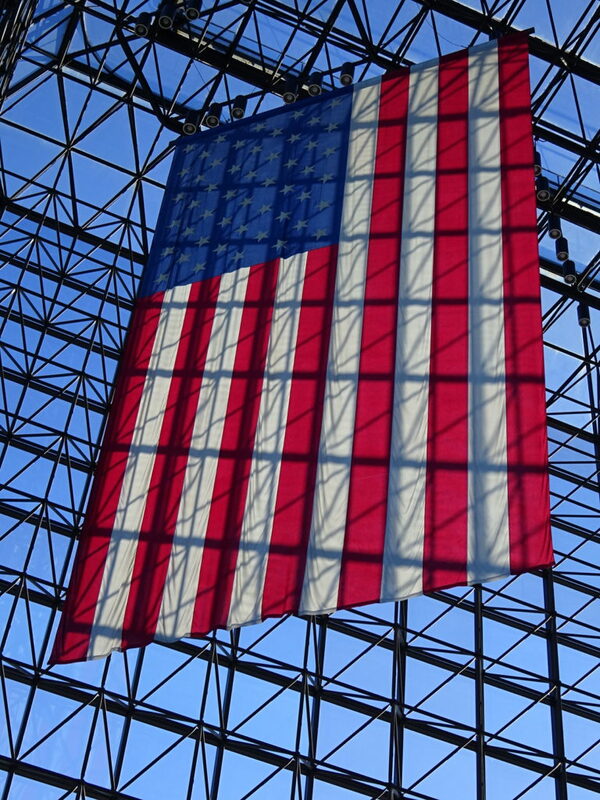 One library wasn’t enough, so I absolutely insisted we go to the JFK Presidential Library. Here’s the thing. It doesn’t matter what’s on your voter registration…if you come across any of the Presidential Libraries, GO! It doesn’t matter if you voted for the guy or not, or were even alive at the time, the Libraries are AMAZING! Each Library contains all the President’s official papers, which scholars can study (i.e. the “library”), as well as objects used and received while in office, like all the gifts other nations give our Presidents. Gold sword, anyone? The Libraries also each have a museum-like exhibition presenting an amazing snapshot in time putting that particular presidency into context. This was our fifth Presidential Library and we hope to add to that number now that we’re home – I think there’s 13 total. My third time, but Aaron’s first, exploring the Kennedy Library. If you ever have the chance… Go! After the Library, dinner was another treat as we got together with our friend Cari from the Cowabunga Safari in Tanzania! 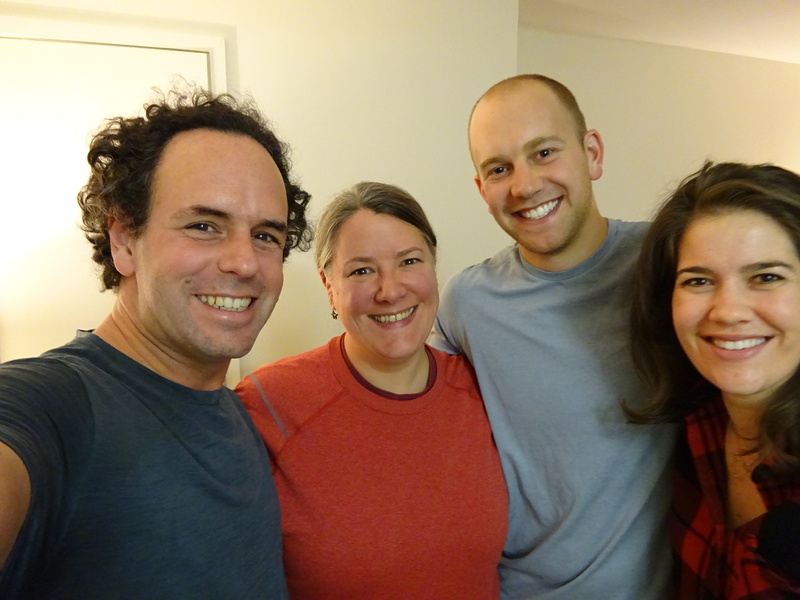 In fact, she drove a couple hours in to Boston just to host us. How cool was that? Thank You, Cari! We asked to do something “Boston-y,” so she first took us to this ridiculously old, classic and just a bit decrepit pub for beers. Perfect. Then off we went to Little Italy for some really amazing dinners before ending the night at a local classic – Mike’s Pastry – for unreal canolis. Mike’s is a line-down-the-block kind of place. Quite the delicious slice of Boston. 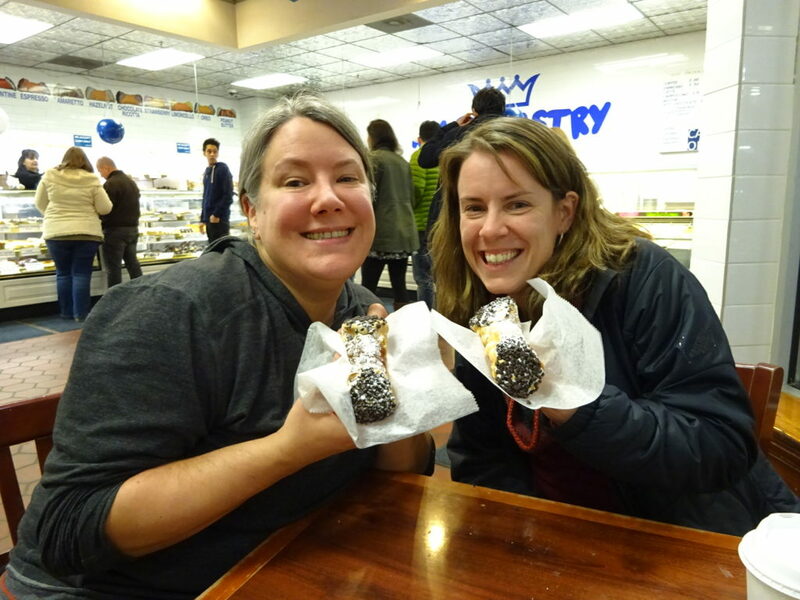 Cari and me enjoy our canolis in little Italy. I’d never had a canoli before! A little different experience than our last get-together…eating goat and dancing with the Maasai! Being a big city, we also managed to sneak in a bit more street art. No tour this time, just found a few neat pieces as we wandered. 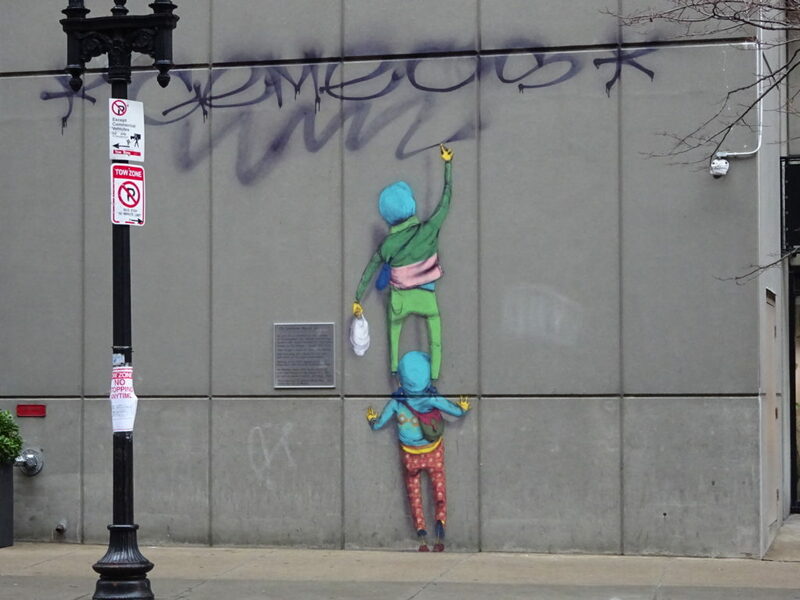 Street art of kids doing street art – love it! Although we found a few pieces, street art wasn’t nearly as prevalent as in other cities we explored. In Boston we confronted extreme wealth and poverty in a way we hadn’t really seen much since leaving the US. It was, and is, upsetting. Not that the rest of the world doesn’t have those two things. It does, but I feel like we were always on one side of the tracks or the other while we traveled. In most places people were just rich or just poor. Expensive suits rushing past while panhandlers make their way was startling to us. 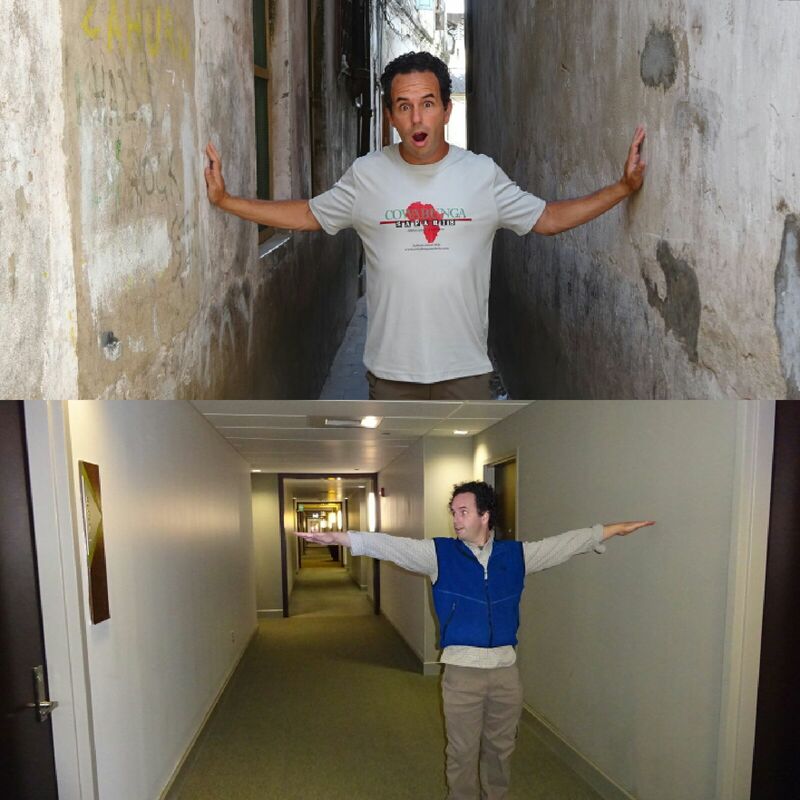 Our apartment building hallway was considerably wider than this little “road” in Zanzibar. Yes, all of this is taking some getting used to. It was weird to be able to read all the signs and the menus and understand the language with no trouble. Weirder still to notice it and discuss it with my traveling partner. “Whoa…check out that sign all in English!” Our apartment came with a couple bottles of wine so we decide to give them to the housekeeper. She didn’t speak English, but it felt so natural to say, “Vino?” And Aaron to chime in with in with an actual conversation in Spanish. She liked the wine, by the way. That was awesome! Know what else was great? Getting free tap water with our restaurant meals! (Europe, making us pay for tap water? That was lame.) Again, kind of a weird thing to notice. Much too soon we found ourselves on a plane to Seattle, filled with nervous anticipation. Simultaneously excited to see our friends, our home, our city, while being a bit devastated that our big, amazing trip was officially over. No matter, we had our tickets and on the plane we went. The last flight of our trip. Unreal!! I can only speak for myself, but that was a forced smile. 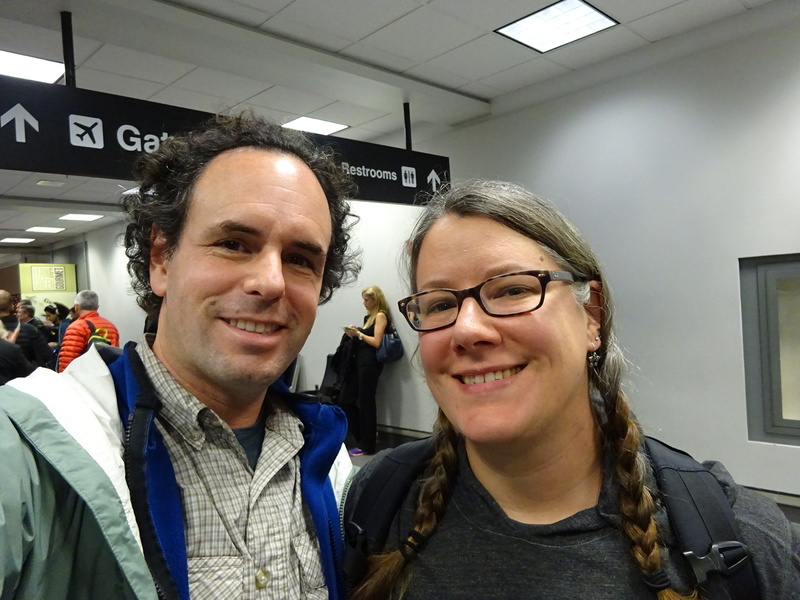 And, with that, we’re juuuuust about caught up on our blogs from the trip itself. Okay, we’ve still got more street art in the works along with the small towns we explored in Spain. Oh, and our “In Numbers” blog. And a bit more on the money. Plus, I promise, promise, promise to add a few gear blogs. Hmm… perhaps we’re not as done as I thought! Stay tuned! More to come with No Map Required! Always fun to read. So glad you are back safe and sound. Happy re-adjusting. Yum, I think I’ve been to Mikes for cannoli both times I’ve been to Boston! The overwhelming feeling of being in a huge shiny store like whole foods after being out of the country for an extended period of time rings familiar too. We knew you’d understand! There’s just something about being in a fully-stocked store after months and months of few options… it’s kind of other-worldly. 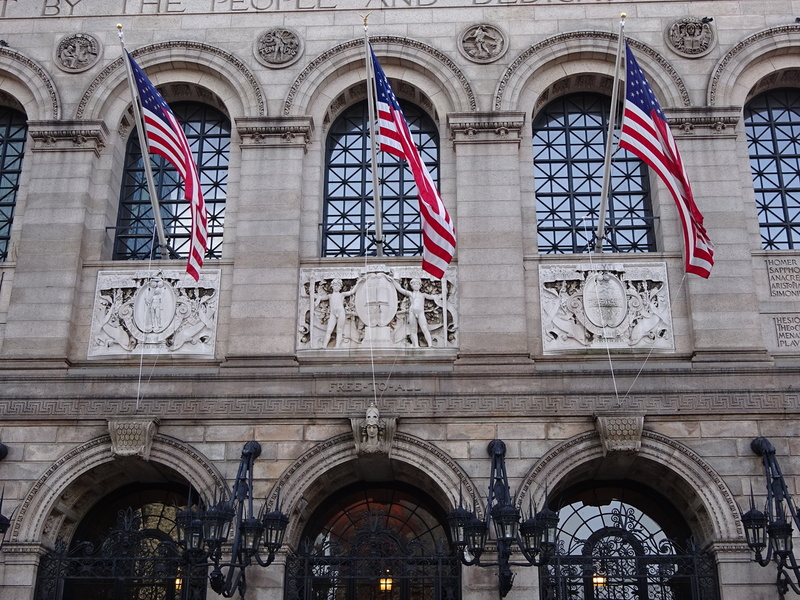 I got a job offer from Boston Public when I graduated from library school… but the interview was at the Nat’l convention in L.A. so I never got to see the library itself,Wow! 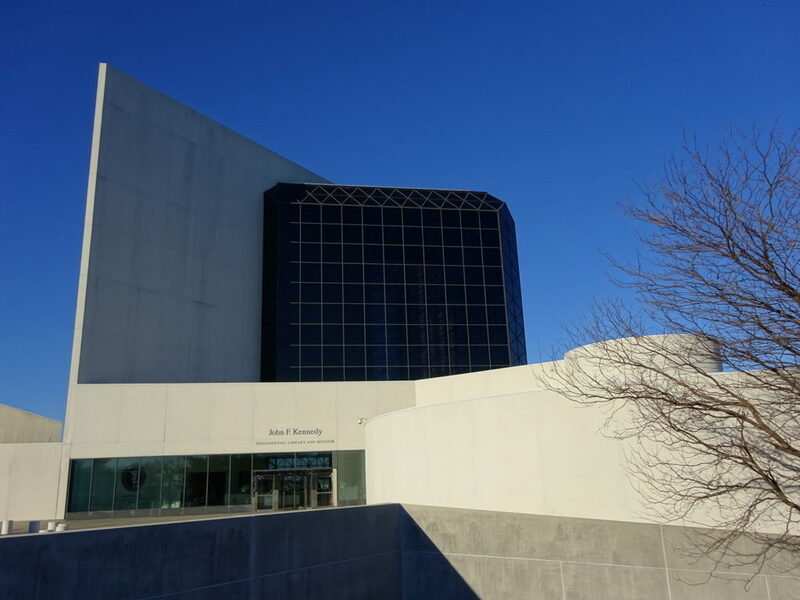 That would have been a cool place to work, But you had to live in the city and the wages were more meager than a small college in Nebraska offered, Anyway, I agree about Presidential libraries.. When I was a kid Eisenhower’s library was half way between my Grandparents home and ours, so we met there several times, One day they were unpacking Mamie’s doll collection and I got to hold several. Amazing!! How cool is that?? Everything today is kept well back behind glass from us visitors, but it must have been mighty special to actually get to hold the dolls. Maybe we’ll ask if we can swing a sword next library we visit. Cool trip. My kids went through a bulk of two grades while you were gone, and my old firm dissolved, plus a big trip to Disney World all were part of the fun here in a more – um – traditional passing of the time. So I did enjoy the glimpse into a sojourn that I will not experience. That is to say – I appreciate the effort taken to put the blog together and give us a chance to experience the trip vicariously. Quite the once-in-a-lifetime experience. Glad you were able to take advantage of the opportunity and do it. Don’t forget a couple of muddy races and Jets seasons. So much, so much. And we didn’t get to even enjoy Monica’s yearly Christmas letter! Guess there’s always trade-offs, but we were glad to get out there and to share it with all of you back home. We learn something new about you every post, Aunt Casey! Boston in your background? No wonder you’re so wicked cool! We bow down to the Pastry Queen. Having only tried one, we’re willing to stay open-minded.